summer | More Tea, Wesley? In late June, Arcana released their summer collection, called Coasts of Cascadia. It consists of seven officially released scents (and one bonus) inspired by the Oregon coast, where Arcana’s lovely creator and scent genius Julia lives. When the collection was first released, I snapped up bottles of Goofy Foot, Pink Saltwater Taffy, and Nacre (this one was at Julia’s suggestion – I was on the fence, but I asked her if it would appeal to floral-haters, and she said yes). A bottle of Echolocation and a sample of Sand in Your Tail were included as very kind extras, Sea Glass was a purchased decant, and then Yurt and Surfers on Acid came to me as extras from various decant circles. I didn’t plan to end up with the whole collection, but here we are! As always, reviews were done without looking at the scent notes, and descriptions were added after the fact. Goofy Foot: An ode to surf culture. Fresh coconut and cardamom with green notes of spearmint, fresh basil, and one drop of vetiver grass. Basil and mint straight out of the bottle. Very herbal, green, and a little spicy, with just a slight coconut sweetness. On skin it’s intensely herbal and cool (that’d be the mint), with a tickling whiff of green cardamom that gets stronger as it goes. There’s a mellow coconut base, but it’s not overly sweet, just kind of rich and smooth. Between the cardamom and the coconut, it kind of smells like Indian food. Not curry or anything, it’s fresher and lighter than that, but I can’t dissociate cardamom with Indian food in my mind. Between the coconut and the mint giving it a coolness, it smells more like a really refreshing Indian ice cream. I wouldn’t call this foodie or gourmand, but I would totally eat something that smelled like this. In any case, I like this better on skin than I do in the bottle (which is the ideal order of things). The cardamom and coconut get top billing, with a bit of mint and spicy basil around the edges. It’s really interesting. I expected it to be much sweeter, and at first I was disappointed – I thought for sure I’d be selling this bottle – but I actually quite like it. It’s very unique. Nacre: The pearlescent sheen found inside certain shells. A mix of the prettiest vanilla with a plenitude of tropical white blossoms, pearl musk, a tiny hint of pineapple, and a quick squeeze of lime. The idea behind the name of this one is so pretty. In the bottle, it’s a very rich, sweet, pretty summer floral. It smells similar on skin – undeniably floral, but with a good dose of vanilla sweetness thrown in. The flowers here don’t seem to be the heady white florals that usually turn me off of floral perfumes (looking at you, jasmine!) – they smell more tropical. Because my floral palette is so limited, my best comparison is to Midsummer Dreams Apothecary’s Mermaid, which is another sweet summer floral, and the first and only floral I’ve ever really loved. I think if you like sweeter florals, you’d love this. I have a very tenuous relationship with floral scents, so I’m kind of on the fence. I do like it, but sometimes it’s just a bit much, especially on initial application. However, once it dries down, I’m fully on board. The floral notes soften just enough to let the sweetness shine. It’s very pretty, and very summery, and joins the very distinguished ranks of Florals I Actually Like. Pink Saltwater Taffy: A candy pink blend of cherry, sugarberry, black and gold raspberry, vanilla fondant, white sugar, and a grounding touch of patchouli. In the bottle: PINK. Sweet, syrupy cherry and raspberry. Smells like cough syrup, or sticky red lollipops. On skin it smells like straight up cherry hard candy at first, but then something peppery comes out to play. It grounds the scent and adds a spicy edge that’s really interesting. For a scent that started out so ridiculously, artificially candy sweet, it ends up being kind of deep and spicy and intense. It’s still sweet, don’t get me wrong – if you don’t like sweet scents, run away from this one. But it’s not just sweet. It kind of smells like if cherry lollipops, Red Hots, and a tiny bit of black licorice had a baby. (None of those things are in here, minus the cherry, but I stand by my statement.) Sweet, spicy cherry with a rough edge. I expected this one to be my favorite, but it’s not. I like it well enough, but I like others more. Echolocation: How whales find one other. Ambergris and amber resin with ruby grapefruit, sweet guava, saltwater, vanilla pods, and the merest hints of patchouli and vetiver. In the bottle: deep, musky grapefruit. Sweet but thick and a little salty. On skin it’s grapefruit, a little brighter than in the bottle, and the whole scent is sweeter and smoother. It’s fruity and sweet, but also deep and a little tangy and unctuous with a slightly murky undercurrent that gets a little more prominent as it wears. It’s really interesting and kind of weird. I like it. I know that this scent lists ambergris among the notes, which is why I didn’t buy it despite liking the sound of most of the rest of the rest of it. The last time I encountered ambergris in a blend, it smelled like rotting fish butts. Thankfully, this does not smell like that. It actually smells really good. Kind of strange, but still – really good. So I’m really glad that Julia included a bottle, because I never would’ve given it a chance, and that would’ve been dumb. Also, this is one that benefits from a little shake before application. Sand in Your Tail: Summer nights are fun while they last. Musky black vanilla beans and sultry orange blossoms with smoky tree resin, ambergris, pink pepper, tabac, and rich incense. First reaction: I don’t know what this is, but I don’t like it. After further sniffing, it’s very floral, and musky in an unpleasant way. On skin it’s better – still quite floral, but smoother and very slightly sweeter. It’s a powdery, slightly fruity floral over a strong, musky, incense-y base, plus a little bit of sweetness. I wouldn’t say I straight-up hate this or anything, but I don’t really like it either. Definitely not for me. Sea Glass: Gifts from the sea. A delicate blend of violet petals, bee balm, translucent honey, neroli, tuberose, narcissus, and skin musk. In the vial, this is sweet, fresh, and delicate. On skin it’s the same. It’s floral, a little powdery, but there’s also something fresh and green in there, and a little “natural” sweetness, if that makes sense. The floral elements amp a bit on my skin, so I’m not super into this for myself, but I can appreciate it for what it is. The name is very appropriate – the scent comes across as delicate and translucent. It’s very pretty. Yurt: The scent of sleeping in a rustic yurt surrounded by old growth forests. Glowing dragonsblood resin and cedarwood with hemlock, fir needle, juniper, and bonfire smoke. In the vial: a pine or evergreen forest – sharp needles and sticky sap. On skin it’s deep and green, resin-y and almost a bit sweet. (Not in any sort of sugary way, though. That would be weird. Just sweet like plants can be.) I didn’t know if I would like this one, but it’s really interesting. The resins and woods get stronger as it dries, and the whole thing has a kind of “glowing” aspect to it that I can’t really describe. It smells like camping in a deep, dark, pine forest in the summer. Hot and green. This would smell amazing on a man, but I’m kind of digging it for myself as well. I don’t think it’s a bottle purchase, but I’m very glad to have a sample. Surfers on Acid: Sweet coconut milk, pineapple, and absinthe. This is a bonus scent created for the collection, but not officially released with it. I received a sample from a decant circle., but it is available in very limited quantities direct from Julia, either via email or on Ebay. Cold sniff: a sweet tropical drink with a boozy edge. On skin a sort of licoricey/anise note is immediately the strongest, with the sweet pineapple and coconut lurking underneath. It takes a classic piña colada sort of scent and turns it on its head into something almost medicinal. As it wears the anise does soften a bit and the sweet fruitiness gets more of a chance to shine, but it’s never as sweet as it is in the vial. I like it, thank god, but I stupidly ordered a bottle after I just sniffed it in the bottle. You’d think that after a million years of hoarding and testing perfume oils, I’d know better, right? But no. “Extremely limited quantities” is a dangerous phrase, my friends. Overall, this isn’t my favorite Arcana release ever. There were no HUGE hits, but there were still a few winners: Goofy Foot, Nacre (once it dries) and, surprisingly, Echolocation are my favorites. I also like Surfers on Acid, though not quite as much as I do in the bottle. Sand in Your Tail is the only one I would say that I’m really not too fond of – it’s just too floral. Arcana products can be purchased from The Soapbox Co and The Rhinestone Housewife, among others, or direct from Julia via email (julia at arcanasoaps.com) or on Ebay (select scents). Blooddrop’s new summer collection, “Together: Women & Horses” is based around vintage photos of, well, women and their horses! Each scent has a photo to go with it, which is featured on the label of the corresponding full-size perfume. The little stories spun to accompany the photos are charming, and worth a read. When this collection was released, my little apple-loving head just about spun around and exploded. So many perfumes with apple notes! I got in on a decant circle, and I’m glad I did – many of the scents I would’ve blind-bought just from the notes alone turned out to be ones I’m pretty meh on, and a few that I wasn’t sure about turned out to be winners. Perfume is unpredictable that way, even if you’ve been sniffing and testing and collecting for years. Bless you, decanters! As always, my reviews were done as blindly as possible (considering that the notes are written on the decant labels), with descriptions added after the fact. A Venerable Pair: Orchard peach, warm ginger, chamomile, and white tea. In the imp it’s sweet, fresh, and fruity. It’s doesn’t change much on skin – it’s all peachy sweetness (but not peach pie sweet or anything) with something almost a little floral floating underneath. That floral-ness gets a lot stronger as it wears, and after a while I get some kind of tea note. It smells like really floral jasmine tea or something. I usually like tea scents (specifically black tea), but this one’s not doing it for me. Overall it goes much more floral than I expected, especially looking back at the notes. Alas, not for me. Fabulous Golden: Iced tea, juicy pineapple, and sweet passion fruit. In the imp it smells like some kind of sweet tropical drink. Pineapple for sure. On skin pineapple is the strongest note, juicy and sugary, not tart at all. I can’t tell what else is in here, honestly, but it’s all very, very sweet – verging on cloyingly so. I actually wish that the pineapple were a bit more fresh and tart, because I feel like it might help balance the rest of it out. And again, after a while I get something almost the slightest bit floral. Looking at the notes now, I assume it’s the iced tea that I’m not loving. It’s like iced tea with a million pounds of sugar. Southern sweet tea. Not sure where the floral thing is coming from – the pineapple? Passionfruit? I usually like passionfruit. In any case, I’m not loving this one either. Flagstaff Fillies 1: Bubblegum, raspberry sun tea, macintosh apples, bright lemon zest. In the imp: bubblegum! On skin it’s, yep, bubblegum. I know there are other things in here, but all I smell is bubblegum. 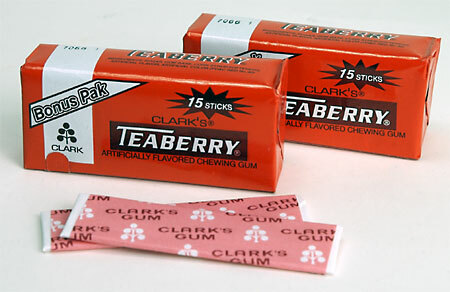 It actually smells exactly like this Teaberry gum that I used to love as a kid. Exactly. It’s uncanny. And I love it for that, but I don’t know that I want to go around smelling like Teaberry gum. I will certainly keep my decant, but I don’t think I’ll need a bottle. Looking at the notes now: WHY DOES THIS SMELL LIKE TEABERRY GUM?? Flagstaff Fillies 2: Granny Smith apples, bamboo, Murcott tangerine, green banana, ginger, vanilla, and white tea. In the imp it smells a bit like unripe bananas. It’s banana, but green and almost slightly floral. On skin I get a little ginger to go along with the unripe banana. After a few minutes I get something similar to the floral tea note from A Venerable Pair, but it’s not as strong, and the rest of the scent is fruitier. The whole scent is very mild, though. Even with my nose right above my wrist it’s kind of hard to make much of it. In Good Hands: Hazelnut cake, marzipan, honey, and buttercream. In the imp: YUM. Very sweet and cakey. it smells like amaretto and frangelico. On skin it’s smoother, without that intense liquor-y sharpness I smelled in the imp. It’s sweet and nutty and buttery. No complaints here. I’ll definitely be adding a bottle of this to my collection. Never Come Between a Woman and Her Horse: An oh so romantic ladies perfume of rose bouquet, vanilla, sandalwood, and carrot seed. In the imp I get rose, sharp and green. On skin rose is still the dominant note, slightly perfumey, with thorny green bits underneath. As it wears it goes a bit powdery, though there’s still a freshness to it. Looking at notes, I think when I got this I assumed it would be sweeter from the vanilla, but it’s not really sweet at all. The powderiness is almost certainly the sandalwood. In general I don’t mind this one, but I do prefer my rose scents sweeter. Our Sunday Morning Rides: French toast with powdered sugar, and coffee brewing in the background. In the imp: delicious coffee. Very sweet, with kind of a caramelized toastiness to it. On skin the coffee isn’t as strong – I get more of that yummy cake/bread scent. It’s sweet and caramelized and actually reminds me a bit of Les Madeleines – I even think I smell a bit of sweet orange, though I may be hallucinating that. The coffee is faint in the background, but I’m happy about that since I rarely like strongly coffee scents. This smells like a really delicious breakfast. It also smells a lot like Froot Loops, which I will not even endeavor to explain because looking at the notes, that makes no sense whatsoever. But. It does. And I like it a lot. It also has the best sillage and throw of the bunch. This one’s bottle-worthy. Overalls in the Orchard: Various apples, fresh green notes and a touch of bright lemon. In the imp: crisp, green, and a little zesty. On skin it’s definitely apples, but not overly sweet apples. Green is the keyword here – kind of a watery Granny Smith green. The apple, alas, is quickly overtaken by a kind of generic “green citrus” note on my skin – it’s pleasant enough, clean and Springy but nothing too interesting. I can still smell a bit of crisp apple around the edges, but it’s not the star of the show on me. I had high hopes for this one – I almost ordered a bottle un-sniffed – but I’m starting to think that Blooddrop’s apple notes don’t like my skin. THE HORROR. They don’t go bad or anything, but they just seem weak. This scent is very faint in general, and didn’t last long on me. The Old Horse Has Gone to Sleep: Soft blue-eyed musk, brown sugar, lavender, meadow grass, and a wee piece of bubblegum. In the bottle: bubblegum again, but not just bubblegum this time – it’s soft and sweet and almost a little spicy. On skin the bubblegum is at the fore, with a sweet, musky base underneath. It’s not the intense bubblegum of Flagstaff Fillies 1, though – it’s tempered with other things here. I couldn’t tell you what, honestly, but it’s just got more dimension to it. It doesn’t just smell like gum. It’s got a more earthy sweetness to it. After it wears for a while the bubblegum is less prominent, and that musky sweetness takes over. It’s very warm and soft. Looking at the notes now, I guess what I’m getting is the brown sugar and lavender. I’m surprised that I get so much bubblegum, considering that it’s pulling up the rear in the description. I didn’t intend to get a bottle of this, but the decant didn’t get enough interest and was going to be cut, so I ended up sponsoring the bottle. It’s about 2/3 full. I’m happy that it worked out that way, because it’s quite nice. It’s very unique to my collection, too – I don’t have a single other thing that smells like this. Together: Meadow grass, pear, honey, and a blend of citrus. In the imp: soft, grassy, lightly fruity. On skin it smells a bit like honey cough drops at first – not in a bad way! It’s like translucent honey candy with a bit of an herbal edge. A fresh, fruity sweetness comes out after a minute or so, along with a hint of citrus. This one is really nice, though it’s a bit faint on my skin. If it were stronger it’d be a bottle purchase for sure. Scents I’ll definitely get bottles of: In Good Hands, Our Sunday Morning Rides. Scents I’ll consider: Together (only in this category due to its faintness). As for the rest – I’ll keep my decants of Flagstaff Fillies 1, Never Come Between a Woman and Her Horse, and Together (for now, until I decide its fate), but the rest will likely find new homes. I have a tendency to want to hoard samples and decants even if I don’t like the scent, or worse, even if I have a whole bottle, which is really pointless and a habit I’m trying to get out of. I’d like to only keep around samples of those scents that fall into the “I like it, but maybe not enough for a bottle” category. Everything in this post is currently available from Blooddrop. Two bitsies + one 5ml + one 7.5ml. The cap is cracked on Vortex, hence the tape. Perfume is much easier to mail. Before I ever got my first real Darling Clandestine order, I was very generously gifted these babies by some lovely redditors over at /r/indiemakeupandmore. (Thank you /u/DerpYu and /u/janemorrisgoodall!) They were looking to re-home some unloved perfumes, and I had never tried DC – they were like my awesome-smelling fairy godmothers. Reviews were done without looking at the scent notes – descriptions were added after the fact. Darling Clandestine’s scent descriptions tend to be lengthy and more like stories than a list of notes, so the most relevant bits were picked out where possible. Harpy: Harpy is a sailor’s delight, with notes of sea salt and dark bay rum, milk and coconut squeezed with bitter lime. In the vial I get lime, a lot of it, and a tiny bit of sweetness. On skin there’s a coconut-y sweetness, creamy and tropical, that is set off nicely by the tangy lime. The base is salty and musky and there’s something slightly alcoholic about it – it’s reminiscent of drinking salt-rimmed mojitos at night on a hot, sticky beach. I really love this and can see myself wearing it a lot during the summer, because it makes the sticky humidity that is summer in Philadelphia feel almost appealing, instead of what it actually feels like, which is being inside of someone’s mouth. Serpentina: A crisp, green, ethereal fragrance with a little opium bite. In the vial this smells green – like green tea, but deeper, and almost a little smoky. On skin it’s the same – a big hit of green tea, with something slightly smoky underneath. Like smoke drifting in the window of a tea house. And it’s not a charred bonfire smoke or an acrid cigarette smoke – it’s sweet, but not like pipe smoke, which is usually what I think of when I think “sweet smoke.” It’s like burning tea leaves? I don’t know. The base is deep and mellow, and after a minute or two something a tiny bit tangy starts to creep in. This one is really interesting. It’s heady in a way I usually ascribe to white florals, but it’s definitely not floral. It’s just got that kind of feeling. You take a deep breath of it and it fills up your head, like breathing in smoke. I’m not sure I’ll need more of this, but it is really interesting scent and I’m glad I got to try it. Dewlap Valentine: “He loved strawberries and bananas and dark leafy greens and usually had them smeared all over his face so he smelled like all of those things together, plus a little something . . . reptilian.” A wonderfully complicated blend, fruity, salty, musky, earthy, at once dark and sweet and green, morphing over and over on the skin. In the bottle this is deeply, intensely fruity. Very ripe – almost over-ripe – banana and strawberry with a muskiness to it. On skin I’m immediately hit with an odd green tang before the sweetness starts to take over again. It’s very musky and sweet – first the banana is strongest, then the strawberry, then they mix together again before starting all over – but the whole time it has that green tanginess working around the edges. It’s almost salty. This is definitely not your average fruity scent. It’s a bit strange, and very strong. But also very interesting, which is a theme I see emerging with DC’s blends. Vortex: This winter is not your average winter, and Vortex is not your average “winter” fragrance. There’s no evergreen, no mint, no “holiday” spice—just a vast expanse of cold, white and blue, frigid, soundless. Stark and invigorating, this fragrance is purely unisex. In the bottle Vortex is very brisk and clean, almost abrasively so. On skin it’s slightly more mellow, but still a cold, white-blue ozone kind of scent. But at the same time it’s almost a little warm – like breathing in through your nose on a below-freezing day, when the air is so cold that it burns going in. It’s an odd scent experience. I keep pinging back and forth between cold and hot. This one seems a bit less complex than the rest of the DC scents I’ve tried so far – it’s not a morpher, aside from the cold/hot thing – but I like it for what it is and I think it’s appropriate, given the inspiration, which was the endless snow-covered hellscape that was our 2013/14 winter. All of these save for Vortex are currently available from Darling Clandestine, though Evonne is closing up shop tomorrow (6/12) to move. She should re-open again in a month or so, at which point she will be doing DC full-time, which is so wonderful and really couldn’t happen to a nicer person. A welcome respite: Muskmelon, coconut water infused with bergamot flower, kaffir lime, polished ho wood and sticky benzoin. Sanctum is one of Haus of Gloi’s recurring summer scents. I picked this mini sugar scrub up during the last release in 2012. In theory I loooove this scent so I very nearly ordered a full-size perfume, smell unsniffed, when the summer stuff went up last year. Turns out I’m super glad I didn’t! In the tub Sanctum smells like watermelon candy, but not sickly sweet watermelon candy – not jolly rancher territory or anything. More like a fresh, crisp watermelon gummy or something. It’s really nice. Unfortunately it all goes south once I actually use it. HoG emulsifying scrubs leave quite a bit of scent on the skin, which is great if you like the smell… not so much if you don’t. Something about this scent, once it’s on my skin, is, in a word, repulsive. I don’t know what part of it I’m smelling – the coconut water? – but the only way I can describe it is milky vomit. I’ve never experienced this with any HoG scent before so I’m assuming it’s some reaction with my particular skin chemistry, but man is it terrible. I’ll use up my sample because I hate to waste things, but only on my legs. Because they are the farthest from my nose. Would I buy it again? Nooooo no no. Ye gods no. Back, foul creature! RETREAT. Salt air, tuberose blooms, coconut, sweetgrass, tanning lotion, sand, sea, and sun. The lighting was so weird when I took pictures of this sample (and Dandelion Wine). Ugh. ANYWAY. Beach Bum is part of One Hand Washes The Other’s Spring/Summer 2013 release. I received it as a sample with my Valentine’s order. In the pod, Beach Bum smells coconutty and slightly floral. On skin I smell fruity coconut and something a little citrusy, I think it’s the sweetgrass. The tuberose is there, and while it’s slightly more prominent than my floral-hating self would prefer, it’s not an overpowering element and it fits well with the tropical vibe going on here. The scent as a whole is slightly sweet and sunny, perfect for summer. Would I buy it again? Maybe. I do like it, but I’m not in the market for summer scents just yet. (It’s still about 30 degrees here. I weep.) Plus it is a bit more floral than I’d like. So I’ll see how I feel when I place my Spring/Summer order. I’m not 100% for sure getting it, but I also wouldn’t be surprised if it ended up in my cart. Sweet green grass, Dandelions, Tobacco, a hint of Smoke, Atlas Cedarwood, Heliotrope, and a wee touch of Patchouli to ground it. Dandelion Wine is one of One Hand Washes The Other’s new Spring/Summer 2013 scents. Which are available NOW UGH WHY I CAN’T BUY MORE STUFF STOP IT. I received this one as a sample when I picked up Apple of My Eye after Valentine’s Day. Dandelion Wine smells exactly like lying on fresh, vibrant green grass on a warm spring day. Sweet grass and dandelions, with a hint of damp soil. It’s really lovely and perfect for the warmer weather that I cannot WAIT for. Would I buy it again? Yes. I’ll probably be picking up a full-size tube of this when I place my Spring/Summer order with OHWTO. BUT ANYWAY. On to the impressions! Harvest Moon: Tart and fresh and fruity. I have a solid in this scent so I already know it’s lychee and berries and yum. Gracie: Sweet and rich, but not completely foodie. I wasn’t too interested in this one, but then I received a sample of it when I placed my Halloween order and immediately regretted not getting it, so I’m glad I got the chance to snag it on clearance. I loved the sample so much I picked up both the oil and the solid, because I am a crazy person. Be True 2013: Chocolatey floral. A little fruit. I have the 2012 version to do a comparison later. I think this one is stronger. Sun drenched trail leading to a day dream of ripe berries and woods’ rose, rich forest loam, ozone, dark amber and cream. The Brier Path was released with Haus of Gloi’s summer collection. I got mine this past summer (2012), but I believe it’s been part of past summer collections as well. I wasn’t sure I would like this one, because I don’t usually like rose scents and 99.9% of the time amber goes over-powering and disgusting on me, but I have this problem where I am helplessly compelled to covet and lust after any scent that purports to smell like a forest, or be in any way reminiscent of a day in the forest, so I ordered a sample with some other items. And as soon as I sniffed the sample, I fell hard. HARD. The scent is a bit different in the different formats, so I’ll give my impressions of both individually. In the jar the pumpkin butter smells fairly mild – I smell the cream, a bit of rose and berries. On skin the scent becomes much stronger and more complex. The cream fades to the background and the rose and especially the berries become more prominent. There is also that “rich forest loam” note, which brings to mind a sun-warmed dirt trail rather than the dark, moist soil I would expect from a description like that. I actually prefer the former so no complaints there. The amber is minimal to my nose. It really does smell like being in the woods on a warm day, surrounded by thick bushes of berries and wild roses. This pumpkin butter is quite strongly scented and it lasts a good while. In the bottle the perfume is mostly amber, dirt, and rose. Wet on skin it develops an interesting green note, but that fades to the background almost immediately to leave behind a creamy, woodsy rose and berry scent. The green note is interesting – it’s not something I notice in the pumpkin butter. It doesn’t last long after the oil dries down, but while it’s there it really serves to amp up the foresty feeling. The perfume smells a bit different than the pumpkin butter overall, like two sides of the same coin. You can tell they’re the same scent, and they compliment each other wonderfully, it’s just that different notes come out more in each. In the perfume I smell the amber more, but it’s a rare not-horrible-on-me amber (SHOCK! I am seriously genuinely shocked), and the rose is a bit stronger than the berry. That sun-warmed dirt note is still there, and still lovely. The whole scent is, to over-use the word, very warm. It really does remind me of walking in the woods in the summer. The perfume in particular actually makes me think of a very specific visual for some reason – when sunlight cuts through the leaves and you see dust and pollen floating through the golden sunbeam. Is that weird? I don’t know why it makes me think of that. Either way, I love it. Even though it makes me think of summery things, it’s not really a summer-specific scent. It’s deep and strong enough that it can easily be worn in colder weather (like I’m doing today). Throw and lasting power on the perfume oil are good, especially when layered with the pumpkin butter. It lasts 8+ hours on me. It’s not going to knock anyone over, but you can tell it’s there. Would I buy it again? Absolutely. This is far and away my favorite from their summer collection, and easily one of my top 5 scents from HoG’s entire catalogue. If it’s released again this summer, I’ll be buying it in every product I don’t have, and probably a mini pumpkin butter to keep in my purse as well.